Like everything in WordPress, adding a user is a simple process. To get started: access your WordPress CMS dashboard (if you do not know your password you can recover it using the built-in password reset system or request assistance from us). Once logged in, on the left hand navigation toward the bottom you will see a tab labeled Users. On the users page you will have the ability to add, remove, or edit any user you see. To add a user: click the Add New button at the top of the Users page next to the title. 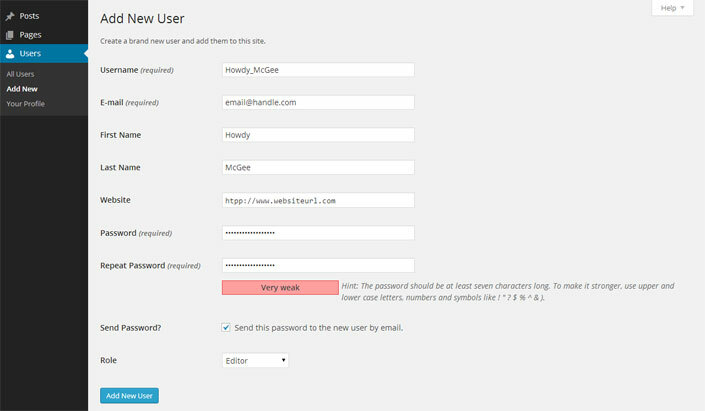 This will bring you to the Add New User page where you are able to enter all the user profile information. The password is the most important field on this page. This will determine how difficult it is for a malicious user to access your account so you will always want to create a strong password. Luckily, WordPress comes with a build in password strength tester. You want to aim for a Medium (Yellow) to Strong (Green) password to make your account, and most importantly your website, as secure as possible. Editor – For vanilla WordPress installation this will be the only user role you will be able to create. This user will have the same permissions that you currently do which means they will be able to edit Pages, Posts, add Media, and have access to the same menu options you do. Shop Manager – If you are running a E-Commerce solution such as WooCommerce then this will be another role you can create. This Role will have access to everything WooCommerce and Products but not to Pages or Posts. Customer – The Customer Role will have the lowest permissions. They will only have access to edit their profile. Once created you can go back in and add their Billing Address and Shipping Address. If you need more User Roles with more restrictions, or would like a role that only has access to Pages or Posts, we can definitely do this for you – Contact IQComputing.